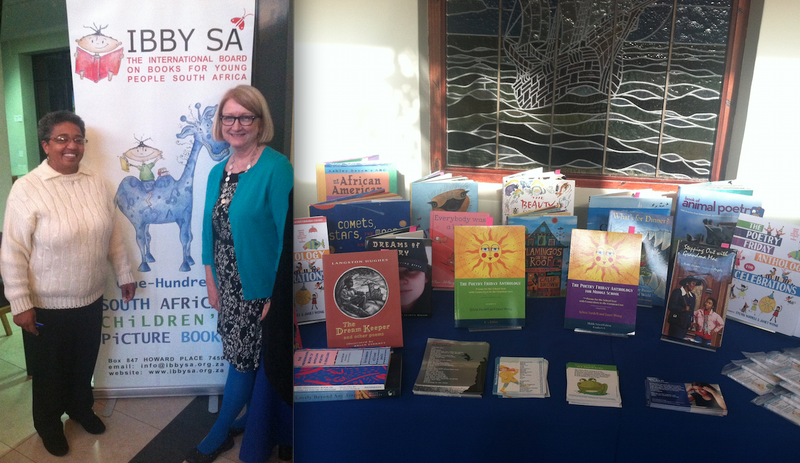 I have been so lucky to be attending the IFLA conference (for libraries and librarians) in Cape Town, South Africa. It's been an opportunity to serve on the standing committee for the Literacy and Reading section, meet colleagues from around the world, and talk with South Africans in several locations about poetry for young people. 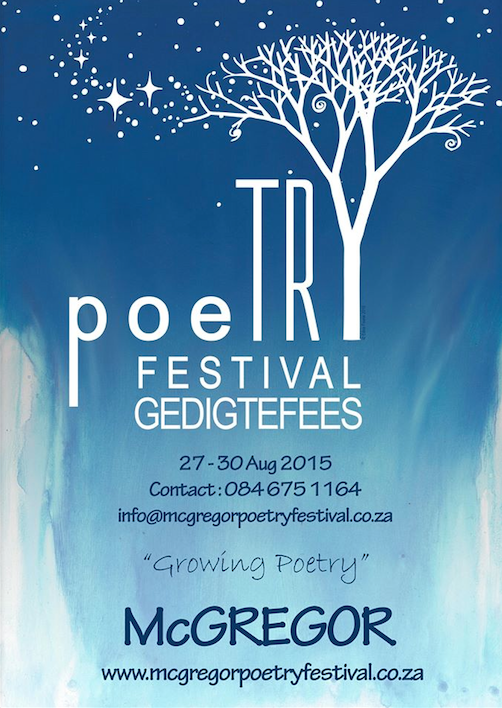 I also found out that there is a big poetry festival next week in South Africa, the McGregor Poetry Festival. Wish I were going to be here a bit longer to check it out! First, I visited the people at Enlighten Education Trust in Hermanus (an hour away). They do all kinds of things for kids in the area, including reading programs, music and toy programs, counseling, and more. 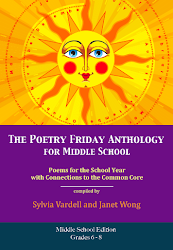 I spoke with a small group about poetry for young people in the U.S., and particularly my "Poetry Friday" work-- and they loved that notion of sharing poetry on Friday-- and getting kids involved in the (Take 5) process. What a dedicated group! Then, I spent the morning with the people at PRAESA, a group dedicated to book promotion and literacy development-- especially their joyous Nal'ibali reading club. 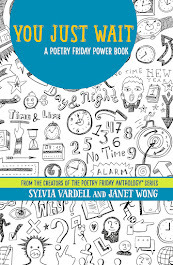 Once again, I talked about what Janet (Wong) and our beloved poets are doing to make poetry available and accessible to young people-- in ways that are participatory and developmental. What a fun group! Finally, I loved being with Jean Williams (who arranged ALL the previous visits) and the lovely IBBY-SA visitors at Biblionef. 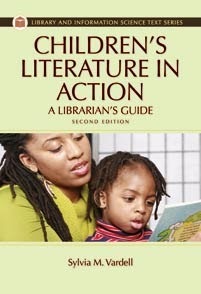 There were teachers, authors, and literacy advocates-- all with great questions and ideas. 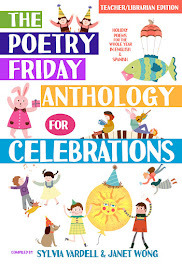 Here, I presented about a dozen U.S. books of poetry, read bunches of poems aloud, and shared our PFA books and approaches too (complete with Pocket Poem cards and postcards which were a big hit!). What a creative group! I was also able to buy a few books of poetry at an area bookstore-- and wish I had time to explore more. 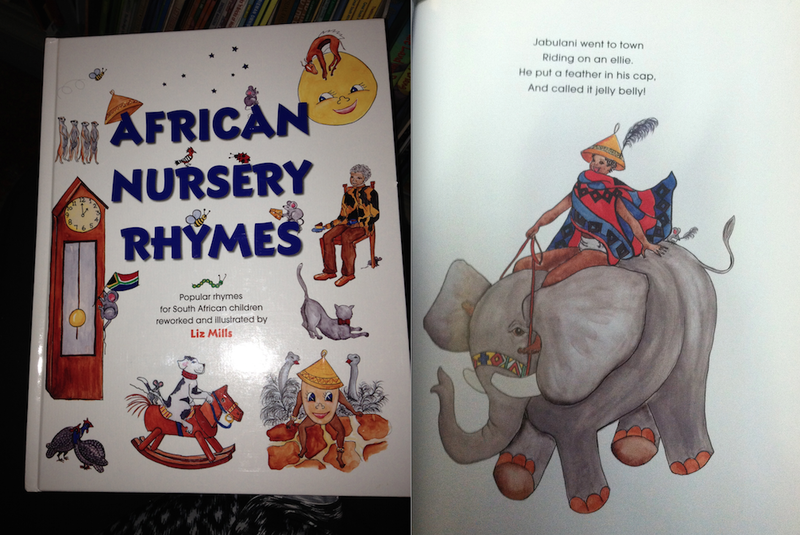 I picked up an ABC and a nursery rhyme collection-- both with an African theme-- clearly for tourists, but very fun, engaging, and informative. There were two poem collections in Afrikaans that looked like delicious nonsense, but I couldn't read them, of course. And I didn't find titles in any of the other 10 languages of this country and I was told there were very few. 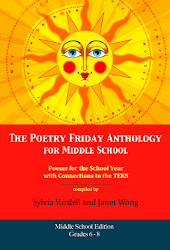 There's a rich tradition of songs and poem chanting, but not poetry publishing-- but each audience told me they were inspired to pursue this further. I hope so! 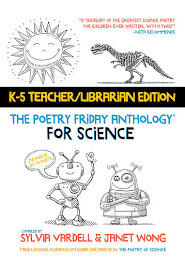 I tried to make a case for how this special genre has some unique things to offer and every child deserved a chance to hear, read, and write poetry! Meanwhile, I feel so privileged to have this interaction with so many different people committed to books, literacy, and empowerment for children and young people. Inspiring! 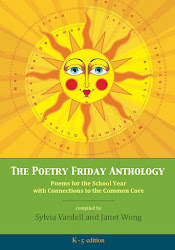 Now, don't miss the Poetry Friday fun over at Reading to the Core. Wow! What an amazing experience. How wonderful to get to share poetry across the globe. I so glad you got to try a pomelo. They are delicious! Thanks for swinging by, Liz and Amy. It's been such an adventure in every way! Thanks for taking us along to South Africa! What an amazing opportunity for you, and not surprised to hear that you are an inspiration WHEREVER you go!!! Oh, Sylvia - I'm sure you're returning with a head full of ideas and an even fuller heart. Looks like inspiration all around, and you're leaving plenty there. 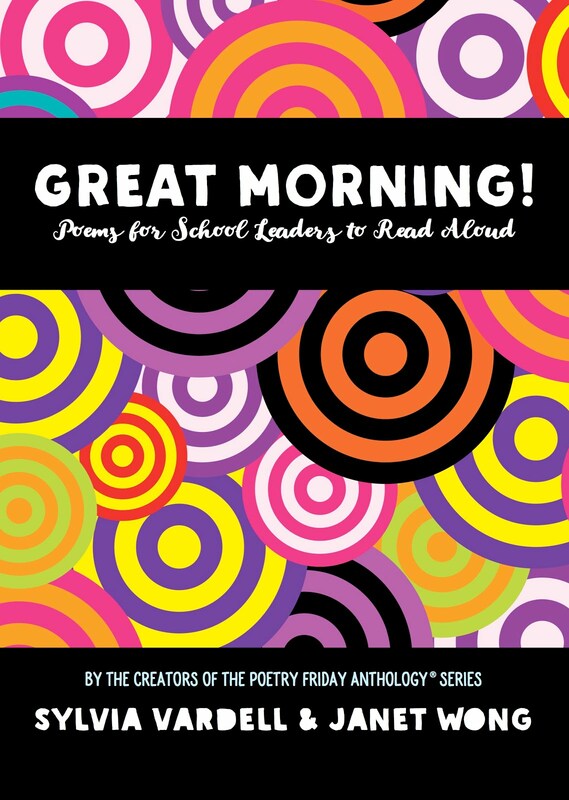 Thanks for sharing about your journey, it makes my heart happy that children's poetry is being used all over the world. WORLDWIDE VARDELL POWER! What a wonderful experience you've had! Thank you for sharing your adventure with us. 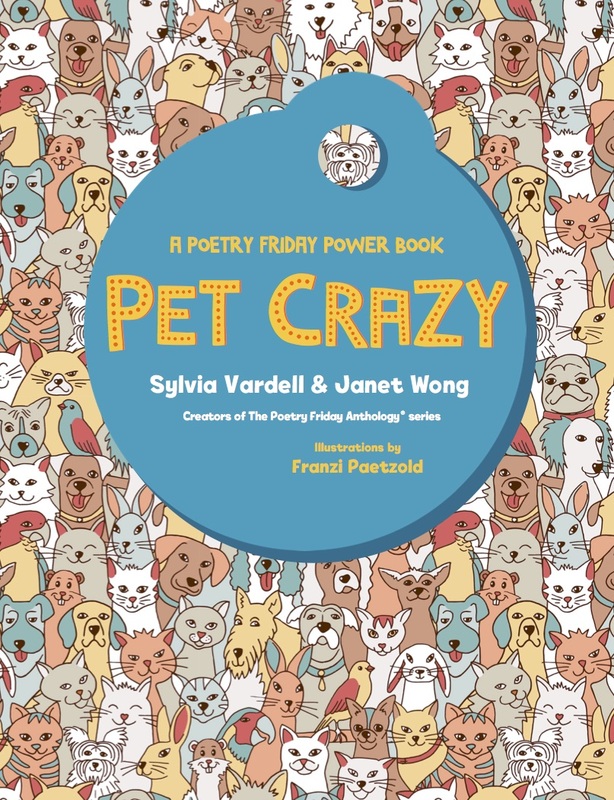 You and Janet are our poetry superheroes! How awesome that you're at the IFLA conference! I'm sure that it must be such a blast. Thank you for sharing your experience. Looking forward to reading more about the events that you're a part of. You and those pomelos! Love love love. Thank you for sharing your experiences in South Africa, Sylvia. How wonderful. 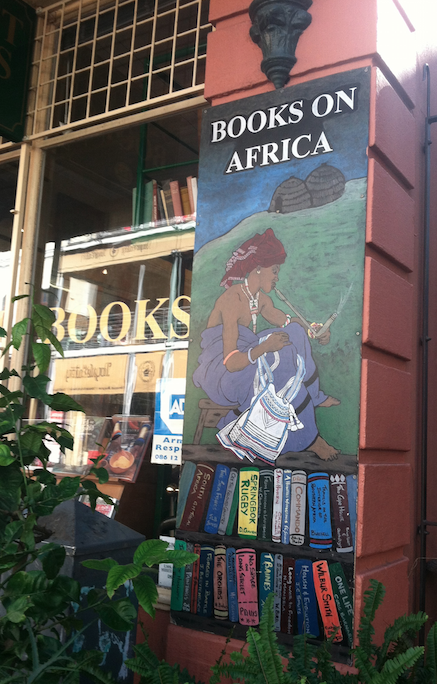 I want to read THE BAOBAB IS BIG! What a wonderful experience! It is heartening to know that poetry is important all over the world. Very interesting trip that you took Sylvia, I totally agree with your line: every child deserved a chance to hear, read, and write poetry! it was wonderful meeting you at ILA15. I've been following your travels, Sylvia - how exciting! Hope to hear even more next time I see you. 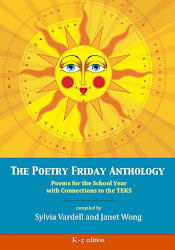 Thanks for hosting Poetry Friday so soon after your return home. 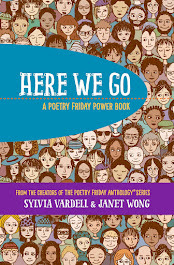 Sylvia, I thank you for doing what you're doing, children's poetry thanks you, you are doing a great service for this genre. Bravo!